I love when indie games try to stand out as being more unique from your standard titles. Pizza Titan Ultra, from developer Breakfall, is one such title and the name says it all. You will try to guide your mobile mech pizzeria in delivering its allotment of pizza in any way possible. The action and premise are absolutely over the top, but does this crazy experience go too off the rails or is it just a zany great time? Pizza Titan Ultra has you controlling or piloting a giant mech delivering pizzas fast and efficiently. The cut-scenes, characters, story and humor, are all very much like a Saturday morning cartoon. It’s not for everyone, but for the most part, I enjoyed the over-the-top delivery and overall fan-service to my younger years. There’s a tutorial you can take to help you with the basics of the controls, but it did take me a while to fully feel comfortable with the mech. You’re going to need to become proficient fast due to as the levels progress they become much harder to make it through and deliver the pizza before the time limit runs out with so much going on. You’ll have to really memorize the patterns in order to get the best score. You’re able to upgrade your mech as you go through to make the proceedings easier and you can go back to previous levels anytime you want to try and get a better score. The core gameplay reminded me very much of Crazy Taxi where you’re trying to get a pizza delivered to a specific target. There’s a pizza radar on the map pointing you to where you need to go. How to get there and how to get there quickly before the time runs out is the challenge, and avoiding or taking out as many hazards as possible, while also not destroying or killing citizens can be a difficult but rewarding challenge once you finally get a great score. Thankfully, there are a handful of different attacks that can be employed to try and destroy the incoming onslaught of new enemies. A standard punch can be used to dispatch medium height aerial enemies as well as most buildings and structures. There is also an overpowered stomp that will create an area of effect that destroys anything on the ground. Lastly, attempting to strike while airborne can result in either an aggressive dive attack or a helicoptering of the mech’s arms. The later of this duo is primarily used to eliminate crafts flying at elevated altitudes, unreachable by a standard punch. You can unlock up to four different super abilities, further allowing you to deliver pizza more proficiently. A problem with this gameplay loop is that things become relatively repetitive as you progress, so even though the maps do change up with plenty of missions to take on, they end up feeling identical in execution and this does get taxing. To help you deal with the enemies you can have your mech stomp, jump in the air, and attack all enemies, but for the most part, I found it much easier to just roll taking out any strategy that gameplay had to offer. While the gameplay mechanics were enjoyable and entertaining at the start, it only takes a handful of missions to see everything that Pizza Titan Ultra had to offer. There are plenty of different objective types, but these are just minor deviations to the unifying pizza delivery mechanic with only a very few instances where delivery isn’t the main focus. Also, the enemy AI is nearly identical every round, with the only variation being the number of troops that show up over time. Eventually, there’s an overwhelming number of adversaries on screen, which is when the slowdown occurs and this can be frustrating. You will always want to keep your speed and momentum up as much as possible to earn the highest score at the end of each level. There are always little boosts to your timer and money you can find scattered throughout each level to help with racking up a higher score. Then, there’s also random citizens that you can run into to make a pizza fresh and ready right away and this can earn you some bonus money if you perform well. The problem is that your timer is always going throughout all the action, so you have to decide whether or not you want to fight enemies or stop and give a citizen some pizza that you just met on the sidewalk. When you finish a stage, the money that you ended up earning can be spent to buy customization options for your mech to give it a different look and you can also change the color scheme. The money you earn is influenced by how fast/efficient you complete a level and by how many buildings you’ve accidentally destroyed. I didn’t encounter any glitches while playing, but I did experience a lot of aforementioned slowdown during heavy action areas that did hamper my enjoyment. 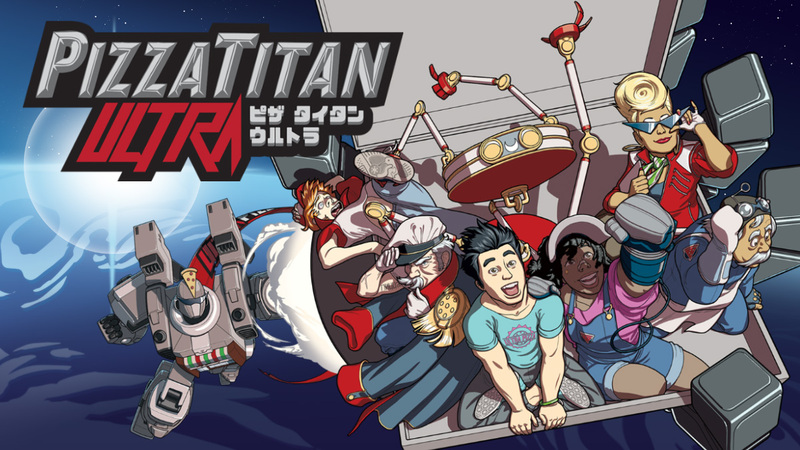 Overall, Pizza Titan Ultra is a fun experience with an oddball sense of humor. You’ll find the most enjoyment if you’re into the arcade style of games and not expecting much beyond that. While a neat concept, the gameplay and flow of the title can get boring after a short time. There is a fair amount of content with the customizable options and plenty of missions to take part in which can be interesting; just don’t go in expecting Dewey’s pizza and realize you’re settling for Pizza Hut which is totally alright!